It was a first round and I got the same guy with whom I played in the last round of the previous tournament. I got Black this time and decided on Petroff defense, last time I played it a year ago with a master getting a good position after the opening and losing later. After his 10. bxc3 I got worried about his possible Bxh7 sacrifice, it looked like a typical position for that, so I played h6. It was a mistake, the sacrifice doesn’t work because after Bxh7+, Ng5+ and Qh5 Black has Bf5. 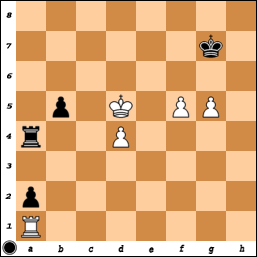 The two book moves are 10… dxc4 and 10… Bg4. The next move 11… Be6 was even a bigger mistake, because of 12. Ng5 with 12… hxg5 losing after Qh5. He didn’t see it. I thought first on playing 15… Qc7, but then decided to keep my queen’s access to the kingside because of Bxh6. By the way that sacrifice has evaluation about -.2, so it is sound. I saw that he can play Ng6 and Nf4 forcing an exchange, but decided to live with it. His 19. Qg4 was unexpected and reacting to it, I missed Rc8 winning the “c” pawn. Then with the same idea I played 23… Rf7 with an intention to move it to c7, but then saw 25. Rxe6 Qxe6 26. Bxf5 and returned the rook back. I didn’t see that 26… Qe2 creates a mate threat and saves the Black rook, so Black has exchange for the pawn. After 27… Rb1 I got annoyed by the absence of the progress in the game and played e5. It wasn’t a bad move, but it created the same R+B endgame that I had with him the last time. He was a bit better then, but exchanged rooks and then blundered the bishop. This time I had to play 38… Bxe5 with a draw, but I hesitated to give him a protected passed pawn. After move 40 I got less than 5 minutes and stopped writing the moves. He pressured and won the “d” pawn, I activated my rook and eventually we got the position on the diagram. At that time I had about two minutes and played on 10 seconds increment. I decided to play b4 and win both his pawns on the kingside after Kc4, Ra5, but then he put his rook on f2, cut off my king and won. The right move was Kf7 and if he plays Kc5, then Rc4+, Rxd4 and then Black wins both pawns on the kingside with a draw. I tried to predict my opponent and I decided before the game that I do not want to let him play his Scotch gambit, in which he two times got an opening advantage and eventually won. Petroff defense looked like a good alternative. It was exactly what happened. I played all the right moves in the opening, though spent quite some time. I think 22… f5 was a first mistake, then 24… dxc4. I didn’t like 24… Nc7 because of 25. c5 and my bishop is hanging on e7. But bishop just could go to d8 then and it is alright. Opening of the position was better for him with constant threat of d5 and pressing on my weak pawns on the kingside. I played 42… Rxd4 having already less than 5 minutes, it was a bad move. Fritz recommends f5 and thinks I could hold this position. He later played g4 and created “f” passed pawn. This pawn became very dangerous, I was playing on increment having only 10-15 seconds and finally lost on time.